Candis Cayne Tries to Figure Out If Caitlyn Jenner Is Attracted to Men or Women in I Am Cait Clip—Watch Now! Caitlyn Jenner is embracing the public life, but when it comes to dancing, she might not totally be ready. 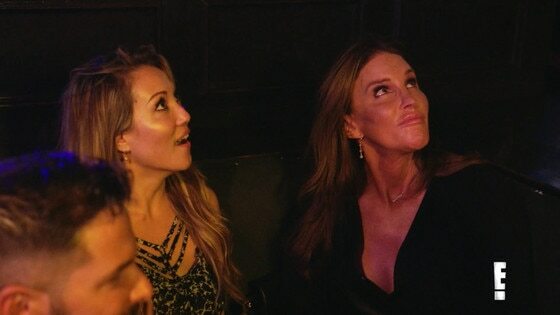 In an exclusive sneak peek at Sunday's I Am Cait episode, Caitlyn and her pals, including Candis Cayne, decide to hit up The Abbey, Los Angeles' famous gay bar. But when the group arrives to party, Caitlyn realizes she might not be ready to dance, club and party the night away. "It's really not my style," she explains in the clip. Surrounded by nearly naked men and one woman dancing on platforms, Caitlyn admits that this really isn't her "scene." But as the night goes on, the E! star becomes more comfortable and even starts making jokes about the environment she finds herself in. "I think all the guys are stuffing," Caitlyn jokes, adding, "Oh, wow! We got one girl!" Another pal notices, "There are a lot of penises and boots." But not everyone could stay in the booth all night. Candis steps up onto a platform and starts dancing in front of the whole bar as her friends cheered her on. Throughout Candis' performance, Cait keeps her eyes on her, even signaling that she would be watching the whole time as she points to her own eyes and then back at the actress. WATCH: Find out where Caitlyn Jenner keeps her Olympic medal! As Cait's rumored romantic interest, however, Candis doesn't seem to know whether Caitlyn is more interested in men or women. But she has some thoughts on the matter. Watch the clip above to find out what Candis thinks! Candis and Cait have discussed her potential future romantic endeavors before, when she expressed concern about how much attention she was starting to receive. "I'm worried about somebody approaching me and how to handle that," Caitlyn admitted in a previous episode. "Would you like to go out on a date?" Candis asked Cait. "Would I?" the 65-year-old replied, surprised. Only time will tell whether these two get together or not! Watch a brand new I Am Cait Sunday at 8 p.m., only on E!